A critical point in the development of microbial endocrinology turned out to be a fortuitous meeting at the 1995 First International Rushmore Conference on Mechanisms in the Pathogenesis of Enteric Diseases, held in Rapid City, South Dakota. Following my presentation, I was approached by a bearded and pony-tailed Richard Haigh, at the time a Ph.D. student at Leicester University in the United Kingdom (and the same Dr. Haigh who is the author of Chap. 16). Richard's interest in my work served as the bridge to Dr. Primrose Freestone who was a postdoctoral fellow in the same lab in the then Department of Microbiology and Immunology within the medical school. Since that time, my association with Primrose Freestone has been, and continues to be, instrumental in furthering the microbial endocrinology field. 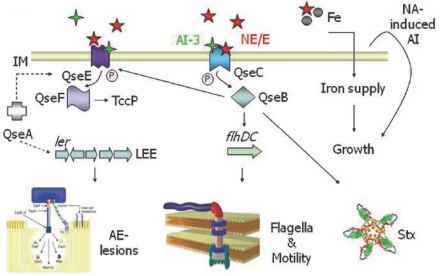 2 years from the time of my first discussion with James Kaper, Vanessa Sperandio and her colleagues published their landmark paper in PNAS demonstrating the ability of catecholamines to influence quorum sensing in Escherichia coli O157:H7 (Sperandio et al. 2003). It is axiomatic that the development of any newly emerging field must of necessity rely on the willingness of researchers to freely exchange ideas. Often, such exchange is either not rewarded with any acknowledgement or, at times, proper citation of papers that were instrumental in the founding of the field. As seems to be increasingly the case in science in general, this may be an unfortunate sign of the current times. Regardless, the further theoretical and experimental development of any field must continue to rely on the free exchange of ideas even though the practical aspects of such scientific exchange often do not match the hoped for ideal embodiment of such ideals, especially the regard for proper citation. publication of my initial papers that helped lay the foundation for microbial endocrinology (Lyte 1992; Lyte and Ernst 1992; Lyte 1993) I became aware of a reference to one of the forgotten secrets of microbiologists that one way to get Clostridium perfringens to establish in mice, in order to evaluate potential antimicrobial agents in the treatment of gas gangrene, was to co-inject epinephrine with the C. perfringens (Traub et al. 1991). This revelation hit me like a thunderbolt that my fear of not properly citing those before me had been realized. What followed turned out to be a journey into a rich history documenting the ability of neuroendocrine hormones to influence the pathogenesis of infectious disease and the many attempts that have been made to understand the phenomena (the majority of these studies have been referenced in my 2004 review, (Lyte 2004). In retrospect, given the usage of neuroendocrine hormones, such as the catecholamines, dating as far back as 1930 in the treatment of clinical conditions ranging from urticaria (itching) (Renaud and Miget 1930) to their current prominent role in the maintenance of cardiac and kidney function in critically-ill patients (Singer 2007), it should not come as that much of a surprise that there has been ample opportunity for the observation of neuroendocrine-bacterial interactions in infectious disease. The study of this past literature is highly instructive not simply as only an historical narrative, but also as importantly as a guide to future research design from a translational medicine viewpoint since it provides evidence of the role of microbial endocrinology both in health and disease in both animals and humans.